AKB48's 34th single [Suzukake no Ki no Michi de "Kimi no Hohoemi wo Yume ni Miru" to Itteshimattara Bokutachi no Kankei wa dou Kawatteshimau no ka, Boku nari ni Nannichi ka Kangaeta Ue de no Yaya Kihazukashii Ketsuron no you na Mono] finished its first week in the Oricon charts and ranked first in the weekly ranking selling 1,033,336 copies . The single sold 916,912 copies on its first day, which were good first day sales for a Janken single, but the rest of the week did not turned out as well as usual for AKB48. Weekly sales are behind last year's Janken single [Eien Pressure]'s (1,073,499) and also slightly behind [So long]'s (1,035,986), making them the lowest first week sales for AKB48 since [Sakura no Ki ni Narou] back in early 2011. 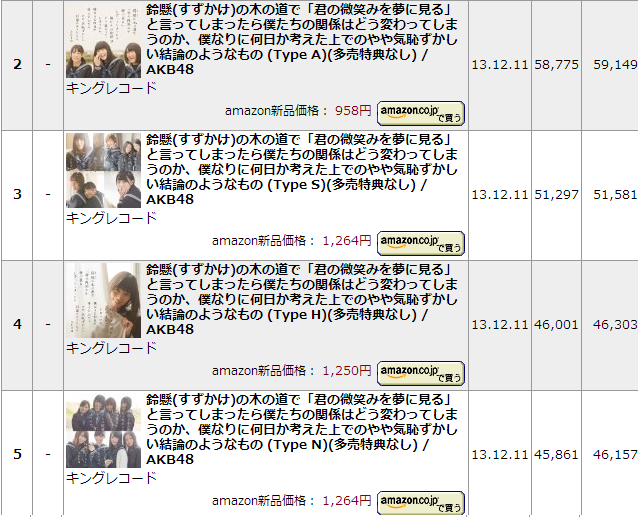 Nevertheless, AKB48 broke the million-in-first-week mark for the 14th time in a row. Meanwhile, in the Soundscan charts, the four regular type of this single took positions 2 through 5, selling a total of 203,190 copes between them. From the difference between this and Oricon, we can estimate the Theatre Edition sold 830,146 copies.